Your childlike wonder has reawakened since becoming a home owner in a Caribbean golf course community. Maybe this has something to do with your morning ritual of sipping freshly-squeezed fruit juice as you pull back the sliding glass door for the day’s grand unveiling. 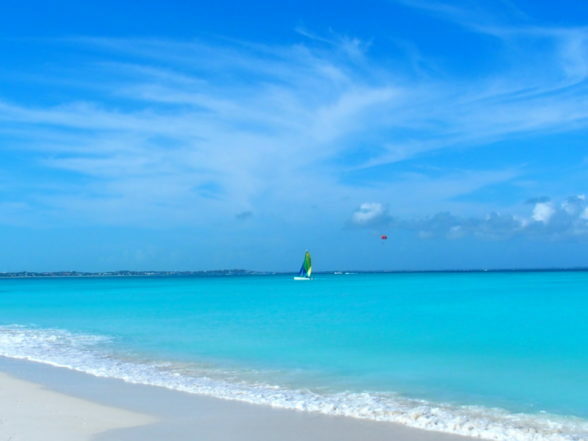 Your heart leaps a bit as you step out on your deck, and gaze at this morning’s version of the turquoise Caribbean Sea. The juice, the view, and a quick shower are all you need before embarking on the activity that’s the signature perk of your new residence. One of the reasons you chose this home, next to this golf course, on this island, is that golf carts are the preferred form of transportation. No rush hour, only friendly “hellos” from fellow island enthusiasts as you motor to the first tee box. What’s sublime about golf in the Caribbean is there’s a chance you’re playing 18 holes on a course designed by one of the game’s most legendary names. Nicklaus, Norman, and Trent Jones have all staked a claim on this region of pristine beaches, palm trees, conch shell tee markers, pink flamingos, and Paspalum fairways. The question is, “If you love to golf, which island is best for your dream home? 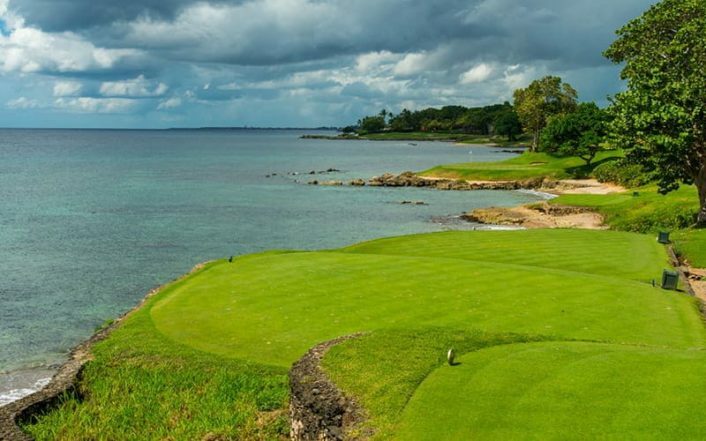 So which golf course is the Caribbean’s best? A strong case could be made for Punta Espada in Punta Cana. After winning the 2010 Cap Cana Championship at Punta Espada, Fred Couples declared this 7300-yard layout as Jack Nicklaus’ best-ever course design. That’s saying a lot when you consider that the Golden Bear has designed over 400 courses in 41 countries. If ocean holes make your heart go pitter-pat, realize that eight of Punta Espada’s spectacular golf holes embrace the Caribbean Sea. Punta Espada is the golf jewel in a Cap Cana gated community that also includes the clifftop Farallon restaurant, a marina, a spa, polo, and residential choices ranging from Caleton Eden Roc’s 26 luxury condominiums or a new start on the spacious acreage of Los Establos. Although Cap Cana got hammered in the global real estate crash of 2008/09, like everyone else, its coming back because of its overwhelming beauty and the sheer size of the community. The real estate options in Cap Cana and Punta Cana just down the road are many. From luxury, beachfront condos to marina villas and luxurious homes on one of the two golf courses, Cap Cana is coming back and properties in both Cap Cana and Punta Resorts offer some of the best value for luxury properties found in the Caribbean based on the amazing beaches and amenities. 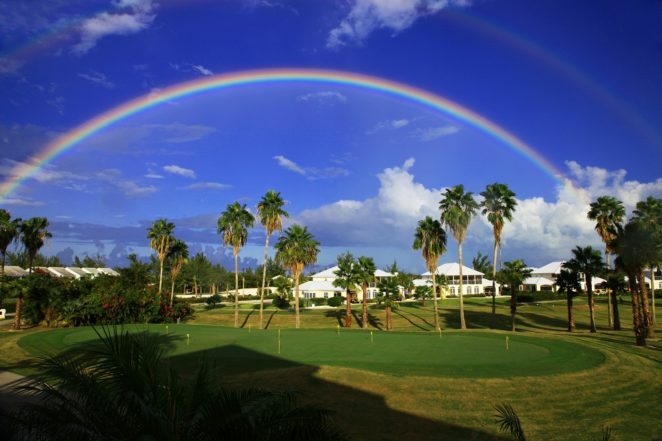 If you have any doubt that Abaco Island is the Bahamas version of golf utopia, all you need to know can be found at The Abaco Club’s practice area. If it appears this massive targeted practice range seems like something the professionals would love, you’d be right. Not only is the Abaco Club a great place to golf, the resort amenities are so high-end that several PGA players own second homes there. The ocean views encompassing the golf course, the restaurants, and the luxury villas are second to none. Discovery Land Company does it again. Creating the best of the best. 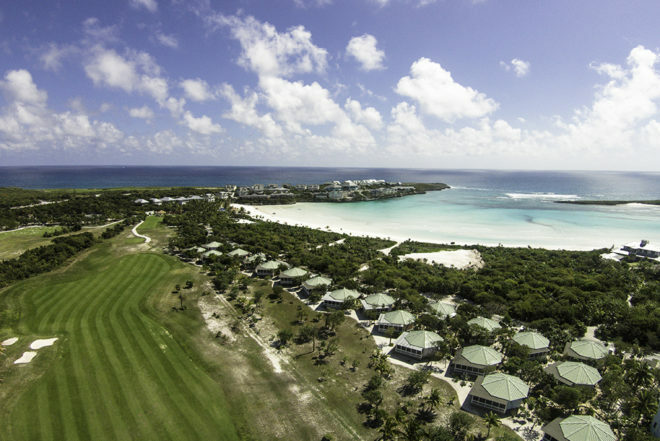 The 585-acre Baker’s Bay Golf & Ocean Club on tiny Great Guana Cay fits the saying, “Great things come in small packages. The sheer breadth of real estate and amenity imagination occurring on this seven-mile long island translates into everything you could ask for in an luxury island golf community. The Tom Fazio-designed golf course is the centerpiece of this community that includes a 200-slip deep water marina, restaurant, bar, spa, and retail center. The course flanked by the Sea of Abaco on one side and the Atlantic Ocean on the other is home to Baker’s island-style “sip sip” comfort stations. Living the Baker’s Bay home owner dream starts at $3 million for those desiring a Marina Villa Residence or Boathouse. The island life at Baker’s Bay can also be enjoyed in cottages, flats, townhomes, waterfront residences, and estate homes up to $10 million. 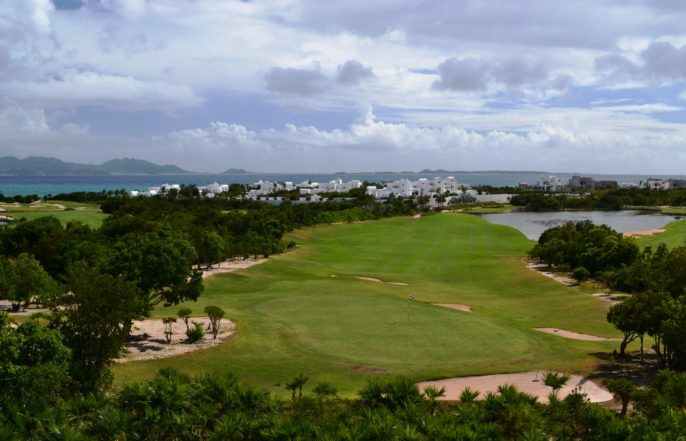 When Anguilla’s CuisinArt Golf Course opened in 2011, golf was a new sport for this cricket-loving 18-mile-long island. Half a decade after CuisinArt burst on the golf scene, the course has garnered a wealth of awards heralding it as one of the Caribbean’s best. Adding a Greg Norman design to an island with 33 of the most beautiful beaches in the world may feel like heaven on earth for the golf enthusiast. Cuisinart has a long-term solution for those who fall in love with its golf course, Five-Star hospitality, Rendezvous Bay Beach, and Anguilla’s splendid island beauty. Greg Norman introduces golfers to one of the world’s most awe-inspiring sand traps on El Camaleon’s very first hole. 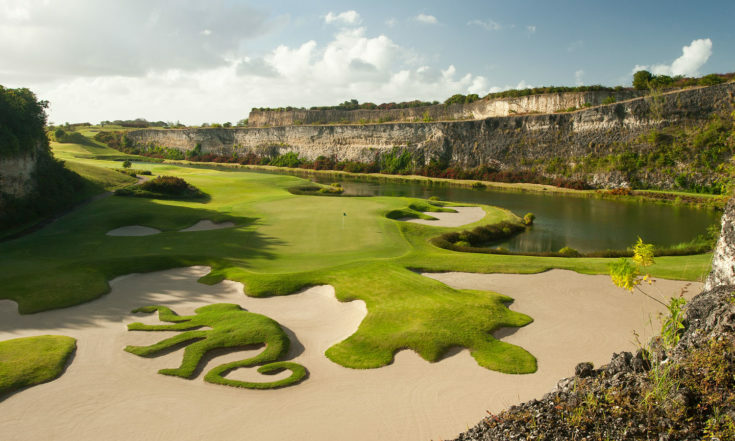 El Cameleon’s first fairway unveils a cavernous centuries- old cenote that was uncovered during the construction of the course. 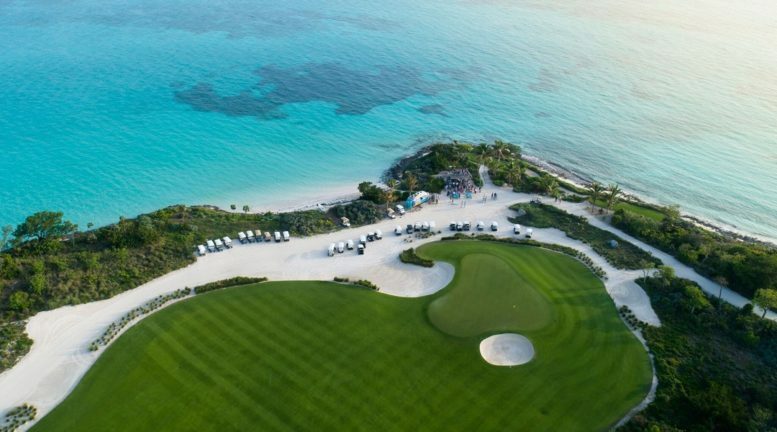 El Camaleon’s course conditions are pro-worthy to the point that the PGA’s televised Mayakoba Pro-Am is held there each February. For the golfer yearning for near-perfect temps and five-star accommodations, El Camaleon is surrounded by the best of the best in luxury hospitality amenities. 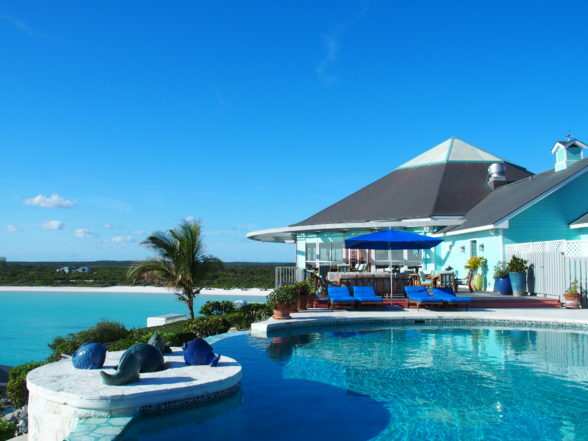 Greg Norman so loves picturesque Exuma, and his signature-designed Emerald Reef Golf Course, that he vacations there regularly. Great Exuma has gained fame as the prime locale for swimsuit issues, private island retreats, top-notch bonefishing, and Johnny Depp’s most famous film series. 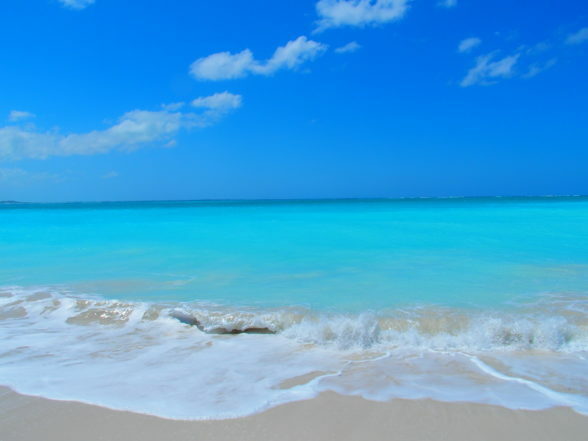 The source of the Great Exuma fuss is the surrounding high-octane water color. 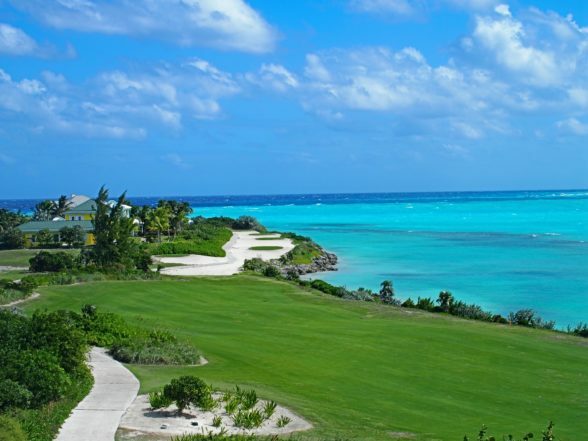 If turquoise is your favorite hue, then you’ll delight in the fact that half of Emerald Reef’s 18 holes hug the Caribbean Sea. When was the last time you played golf at the base of a volcano? When was the last time you exchanged glances with a vervet monkey? When was the last time you teed off with a centuries-old sugar mill at your back? 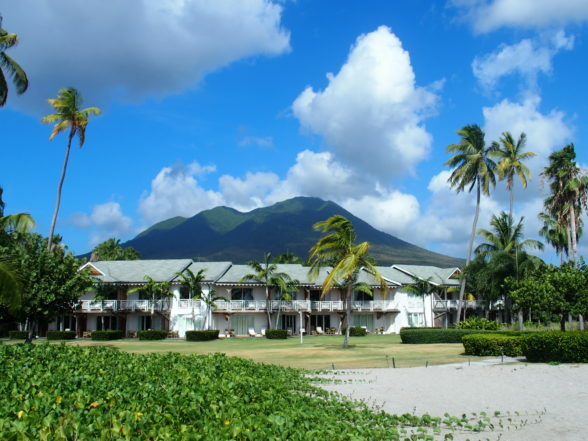 You’ll find all this and more at the Four Seasons Nevis Golf Course. 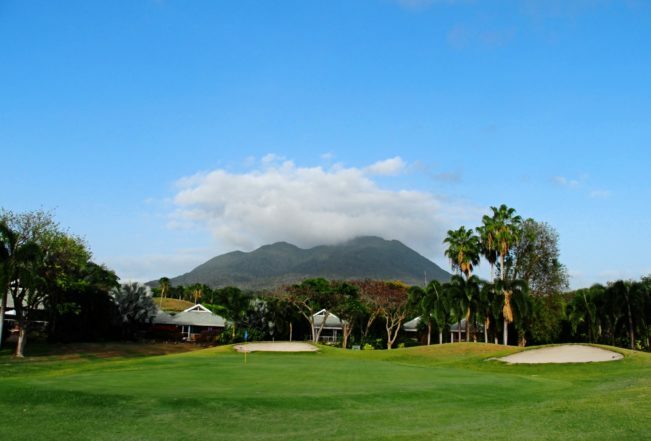 If Nevis is the site of your next tee time, realize that you’ll be playing 18 holes in the presence of Mt.Nevis, a 3,200-ft volcano. This Robert Trent Jones-designed course is so scenic that a golf cart tour is the favorite excursion of Four Seasons’ pampered guests. 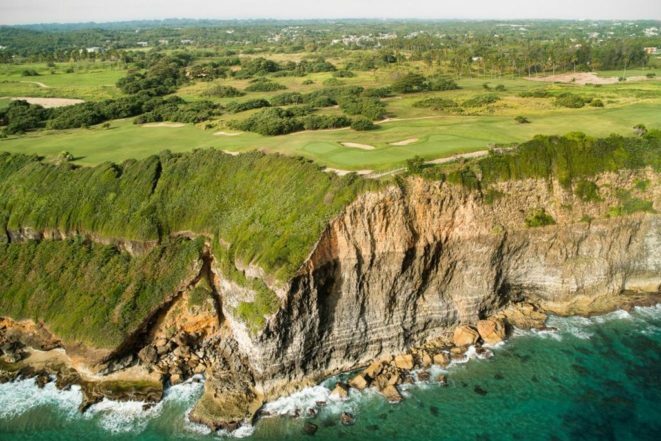 Tom Fazio clearly outdid himself with his Barbados golf masterpiece. On the 16th hole, the Green Monkey’s iconic Par 3, golfers gape at a sand trap shaped like the course’s namesake. Leading up to this visual you’ll experience stone cliff walls, roller coaster undulations, and gorgeous views of the Caribbean Sea. 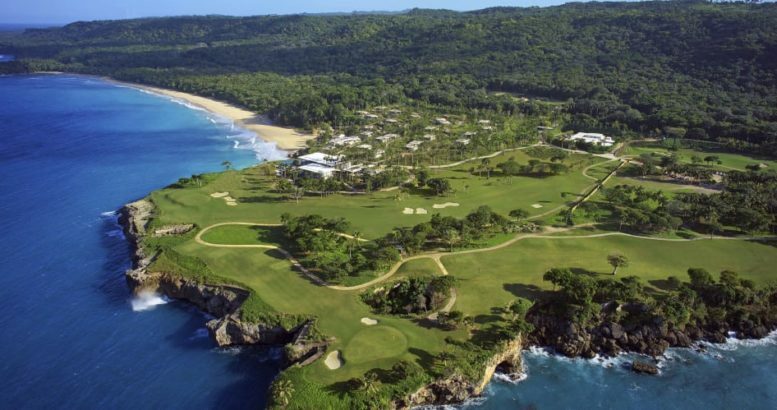 For golfers looking to spread their wings, Barbados’ west coast is also home to Royal Westmoreland and Apes Hill Club. Then again, it’s hard to leave the opulence of the Sandy Lane property, especially considering the style oozing from the resort’s oceanfront restaurants and top-ranked 47,000-square-foot spa. 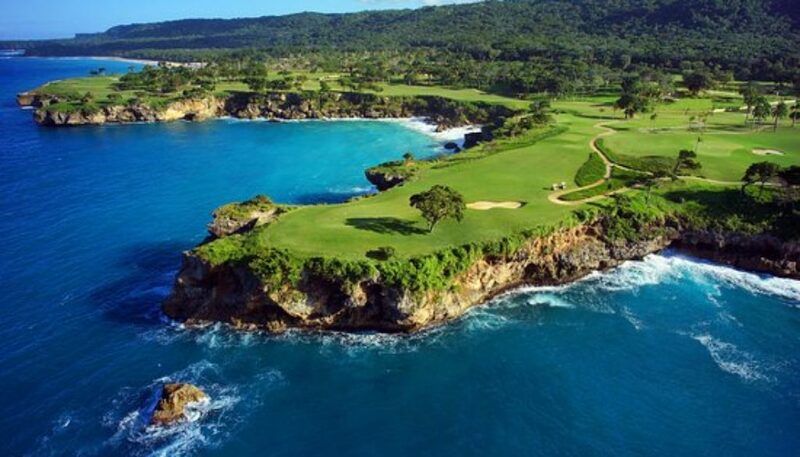 Playa Grande Golf Course in the Dominican Republic was bound to happen. When savvy real estate investors explored beyond Punta Cana, the Dominican’s golf epicenter, they discovered Playa Grande. Opening as the first golf course to position itself on Dominican’s lush northeast coast, Playa Grande was born in 2015. Aman Resorts is the hospitality and real estate brain trust behind Playa Grande. Aman first tapped Robert Trent Jones, and then son Rees, to provide the golf artistic touches within its 2,000-acres. Playa Grande is a wonderful mix of the Atlantic, the Caribbean Sea, two beaches, a mountain range, and a natural preserve. Luxury connoisseurs will note that Playa Grande Club & Reserve is the first Aman property to include golf. Imagine giant cliffs, a hint of jungle, perfect greens, and crashing waves. Royal Isabela is a Caribbean design in which preserving the environment can be felt and appreciated. The result is a terrific 18-hole design with altitude, epic ocean holes, and a hint of Scottish flair. From Royal Isabela’s elevated vantage point you can visualize this boutique resort as a perfect site for a destination wedding, yoga immersion, your next home, and one-of-a-kind golf. Caddies are mandatory for navigating turns and bonding at the sight of exhilarating ocean views on the back nine. Not only is the Teeth of the Dog one of Punta Cana’s most challenging and scenic golf courses, the Pete Dye design also has one of the best names in golf. 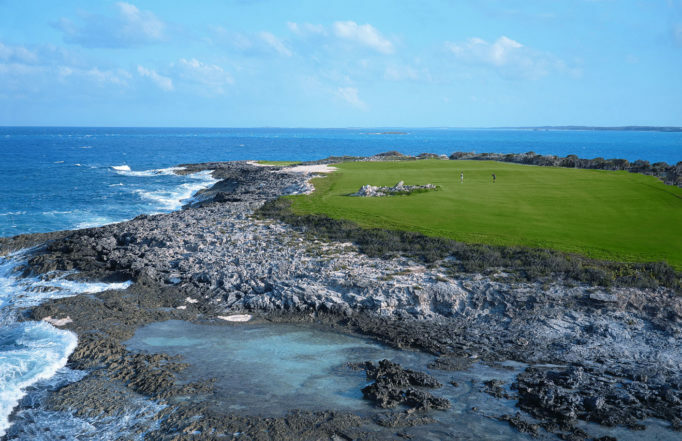 During construction in the early ‘70s, Dye heard workers liken the course’s jagged coral shoreline to “the teeth of the dog.” Nearly 50 years later, the layout Dye claimed he co-created with God is a Caribbean bucket list must. 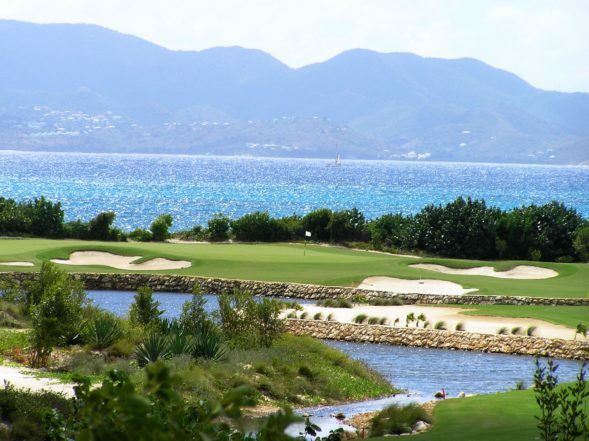 Which Caribbean Golf Community is Right for You? If world-class golf and living the island life is your idea of heaven, owning a home in Great Exuma, Nevis, Punta Cana, Great Abaco, Riviera Maya, Turks and Caicos, Puerto Rico, Barbados, and Anguilla could be your ticket to paradise. Tim Cotroneo is a freelance writer specializing in Caribbean, travel, business, and golf.